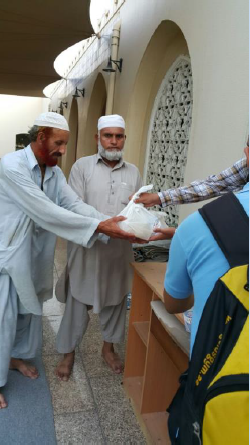 Following Syedna Taher Fakhruddin’s TUS teaching that doing good during the month of Ramadan is as important as prayingnamaaz and fasting, dedicated members of Fatemi Dawat assembled to distribute over 100Iftar packets to fellow Muslims and non-Muslims at one of the labor camps in Al Quoz, Dubai. 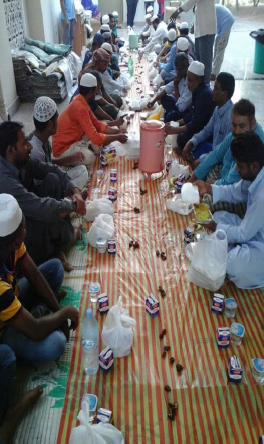 On the 27th of Ramadan (1st July 2016) Prior to Maghrib, volunteers gathered at a masjid in Al Quoz area in Dubai to distribute Iftar packets to muslimeen brothers who were mostly laborers and the underprivileged. This was a first-of-its-kind event in Dubai under the guidance and blessings of the 54th Dai al-Mutlaq and the spiritual leader of the Dawoodi Bohra community Syedna Taher Fakhruddin TUS, promoting the true spirit of Ramadan.